CD review: "Just An Illusion"
This review first appeared in the August 21, 1992 issue of the North County Blade-Citizen (now North County Times). This funky combination of light pop jazz and stylish R&B moves Najee to the very fore of pop music. 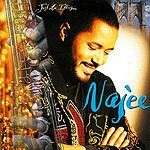 Like Jeff Lorber and David Sanborn, Najee deftly mixes jazz-like instrumental passages (in this case saxophones and flute) with upbeat Motown-style rhythmic figures for an infectious, danceable stew. On his fourth outing, Najee is joined by vocalists Freddie Jackson, Brenda Lee Eager, Caron Wheeler, and Veronica Menyweather. Also kicking in is bassist/songwriter/arranger Marcus Miller, king of light funk. This is Najee's best album yet, easily outpacing somnambulists such as Kenny G, Spyro Gyra and Bob James for a top-notch bit of pop jazz.